Matt Boardman as the demon headmaster in the Lancaster Footlights adaptation. A Morecambe teacher is taking his career to the dark side as he prepares to play The Demon Headmaster. You could be forgiven for thinking that Matt Boardman’s job would be perfect training for his upcoming role in the Lancaster Footlights production. However, the character is actually very far removed from his own. The Demon Headmaster is a controller who tries to hypnotise his pupils so that they will win a TV quiz show. In real life, Matt has been a teacher at Lancaster Road Primary School, in Morecambe, since 2009 and he currently teaches Year 2 pupils, where he uses much kinder methods to help his children learn. 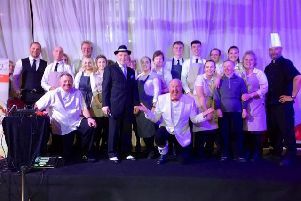 “Everyone involved in the show, from the directors to the wonderful cast, have been incredibly welcoming and extremely easy to work with,” said Matt. Year 2 pupils had a visit from Matt who turned up in character, some were scared and said they prefer their own Mr Boardman, who is not as strict. The Demon Headmaster runs at the Lancaster Grand Theatre from July 7-15 at 7.30pm with Saturday matinees at 2.30pm. Tickets cost £9/£8 concessions, family ticket £30, on 01524 64695 or www.lancastergrand.co.uk or call into the box office on St Leonardgate.